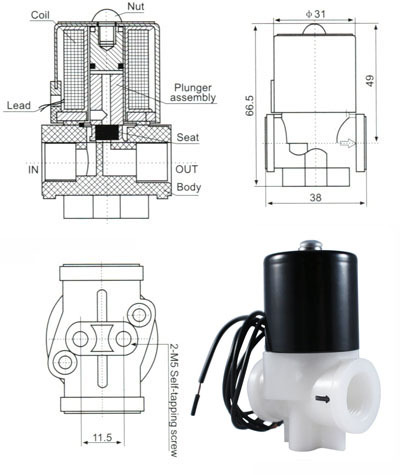 Model RSC-2 of our plastic valve line is a two-way, direct acting valve with a normally closed operating position. This means that there are two ports in which media flows and the valve will open when energized to allow media to pass through. Taking the energy away from the valve will close it and stop the flow. It works across various media such as water, air other low viscosity fluids. *The Orifice size is 2.5mm and Cv value is 0.2. This valve is not recommended for gravity fed systems because of the small orifice size. The port size is 1/4” inch female NPT threaded. The orifice size is 2.5mm and CV value is 0.2. It can withstand pressure up to 115 psi (8 bar) and temperatures as low as -5 C and as high as 90 C. The seal material is EPDM. This specific plastic valve has a 12 Volt DC coil with a voltage range that is -+ 10. The coil head is fitted with a 10’’ wire lead that can easily be connected with your own choice of terminals. The top of the coil features a label that indicates the valve type and specifications. Its response time is very low; in fact, it acts in less than one second, making it a great choice for all types of applications. This model is mountable in any position and features a conveniently positioned arrow on the body to indicate the direction of flow. The valve body is threaded at the base and can quickly be mounted with 4mm machine screws. I bought 6 to put together an extended range GMC canyon to get further into canada without buying gas. I have not installed this item yet. Works well for dispensing water. Soon I will test how thick of a liquid I can pass through it. Definitely a nice little solenoid for my school project. No leaks or anything.